Simona Grey Digital Wall Clock, Model No. 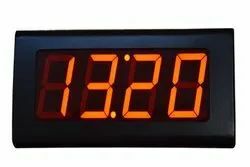 : Si-dc003, Size: 7"
We are one of the prominent retailers and suppliers of a wide range of Digital Wall Clocks. Exclusively designed and developed these clocks are widely praised for excellent finish, appealing look and attractiveness. Following the requirements of clients, we provide these clocks in various elegant designs, colors and finish. 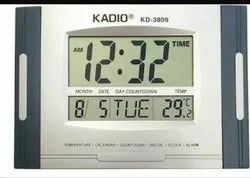 Supplying of digital wall clock. • Now works with USB as well! We are engaged in providing a wide range of Digital Wall Clock to our clients. Features light pearlescent navy and silver finish. Jumbo lcd display wall mountable ; stand for desktop display. Alarm with optional hourly musical chime. Calendar for 200 years, description temperature display in c or f count up/down timer 12/24 hour time format requires 2 x aa batteries (not supplied) great for home decor . So as to accomplish high level of customer trust, we are keenly involved in offering Digital Wall Clock. We offer them at reasonable rates.